If you don't like reminiscing and open displays of strong affection - like a couple kissing in the halls - turn your head the other way. You've been warned. 1. From Breakfast with Pandora - this post about Haven Kimmel, with an embedded original story about teamwork in middle school. You're safe to read this even if you're allergic to the gushy stuff - this is just a great, funny story. 2. 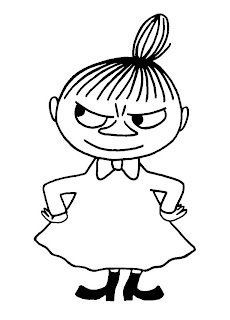 Then this post from Moomin Light referring to that post and a different experience of teamwork in school. That post and my comment on it led to the further comment from DF about the PDA. 3. And now this post by Moomin Light, inspired by the PDA remark. I think this post has been waiting 28 years for a proper voice. Little My was the right voice. 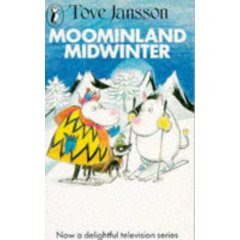 The character behind the Little My category (illustration) is from Tove Jansson's Moomintroll series - particularly Moominland Midwinter , which is still my favorite of her books.